Much is made of how we in Europe will not have much success with tropicals because of the cooler nature of our northerly climates. 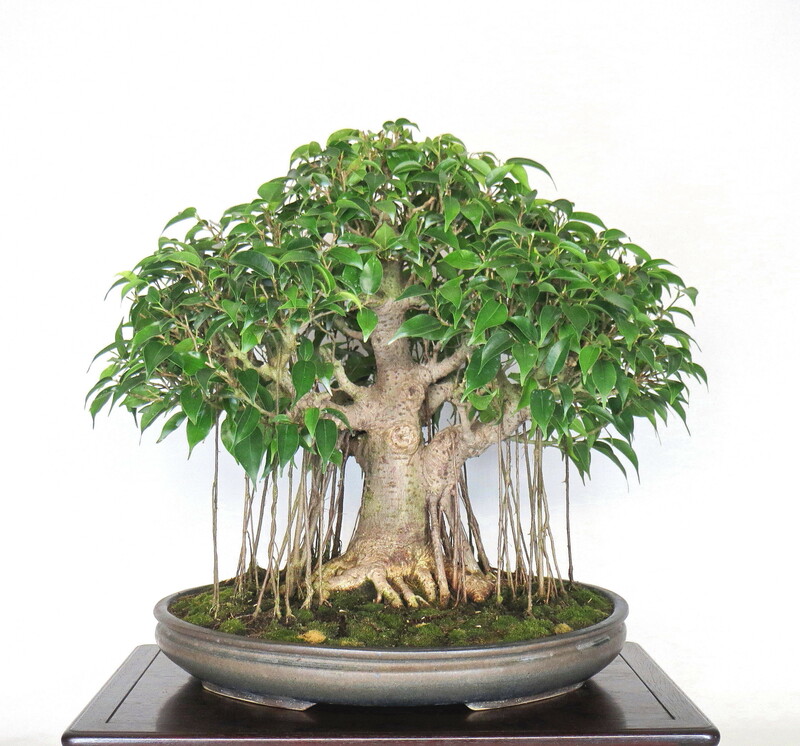 Many of us just settle for oohing and ahhing at pictures of the splendid specimens – most prominent among them being Ficus – that are produced by our bonsai colleagues in more favourable climates such as Florida. But one person has bucked the trend: instead of settling for vicarious enjoyment, Yvonne Graubaek set out some years ago to try to grow her own Ficus in the rather less than tropical climate of Denmark. 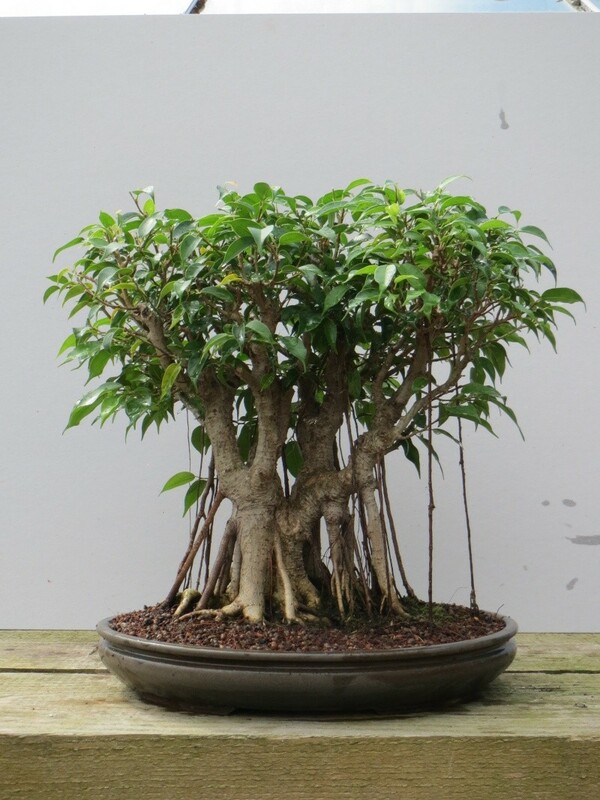 In 1989 I bought three Ficus “Natasha” trees as a group of small seedlings in one miniature pot, in a supermarket. These were my very first trees, and from the start I decided to train them in different styles just for the fun. I separated out the trees and put them into individual shallow bonsai pots. 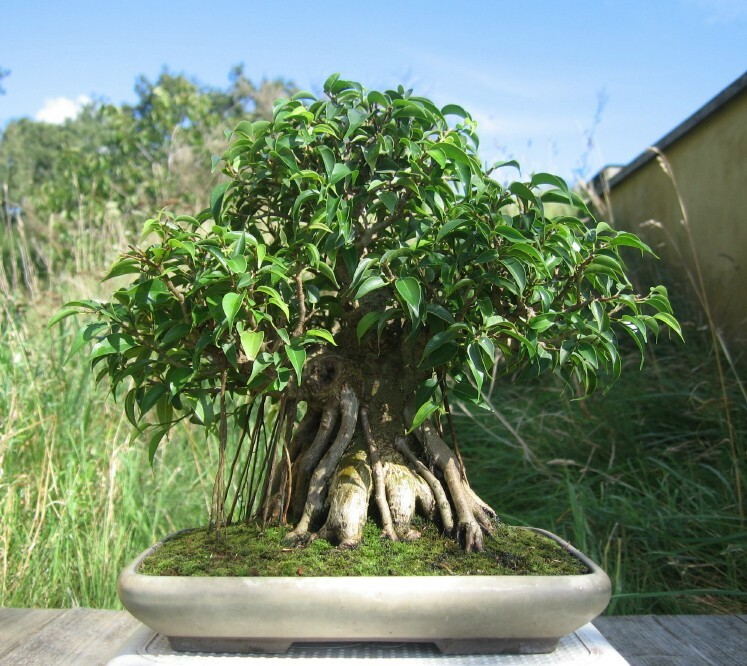 They have been in bonsai pots since. During the years the trees have been kept in small pots all the time. The first pots were shallow shohin pots. I transplanted them every year, and never let one root become long and fat. As the trees grew bigger they had a new pot. I cut the roots very hard back every time, this way they can grow a lot in a small pot. But while the roots were kept small, the trees were allowed to grow tall, and then cut hard back, many times. Two or three times have they had an extra restyle, and also three or four times, have I taken the big scissors and cut a new overall shape of the crown. As you can see, aerial roots have begun to form by now in 2004. Maybe I think, the roots and trunk are not growing so fast any more, due to the aerial roots as they appear to be starting to take over. This is just my observation though. 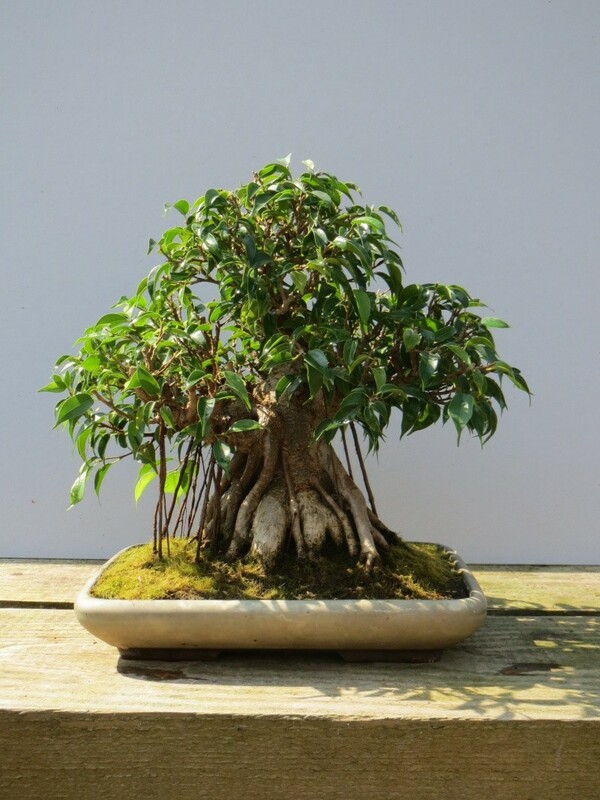 So, I think for success you need to create a good fat trunk before you start up with aerial roots. 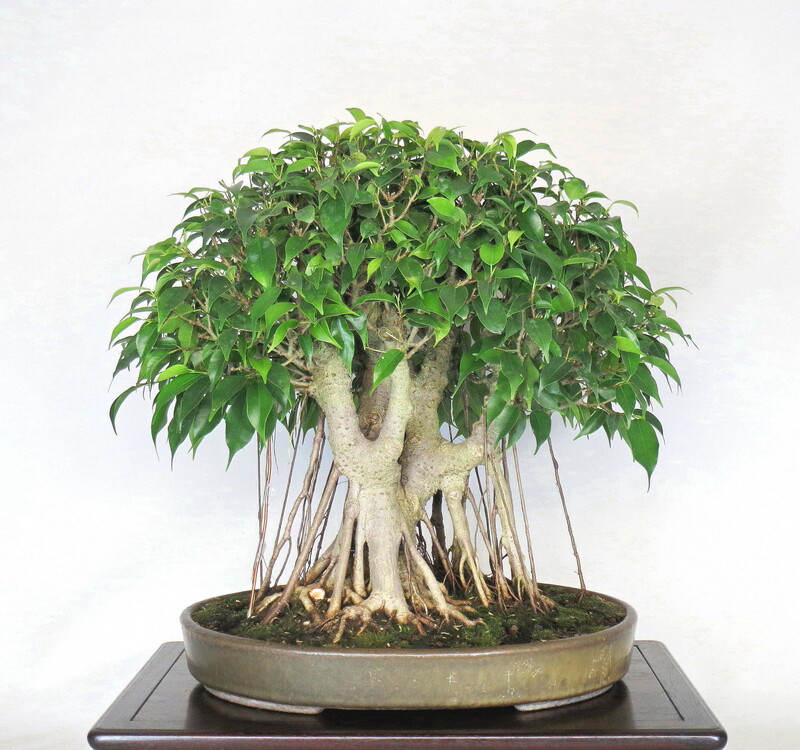 The Ficus were kept in a Greenhouse every summer, and when the temperature got to about 38 degrees, I opened the doors. 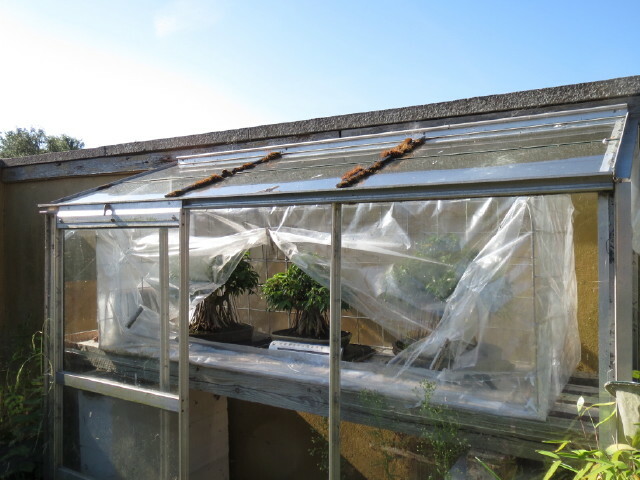 In the summer of 2010 for the first time I kept the trees in their own little separate damp environment house within the greenhouse, which made the aerial roots grow much faster. 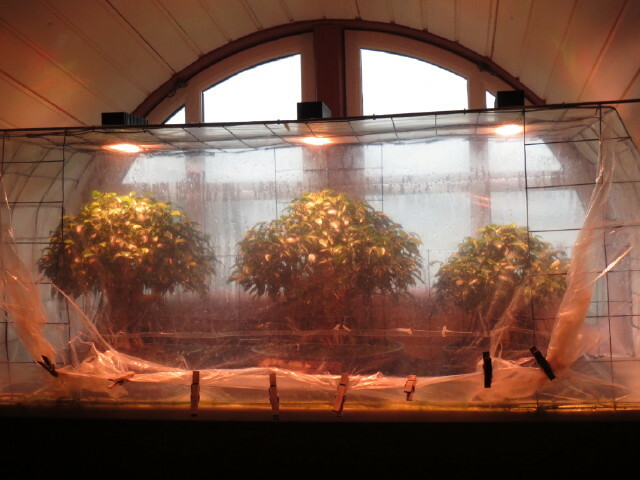 Then in the winter of the same year I moved the humidity houses indoor to my south facing window. It was entertaining to see how they grew the aerial roots from day to day, but I did not really know how the trees would respond over the winter. 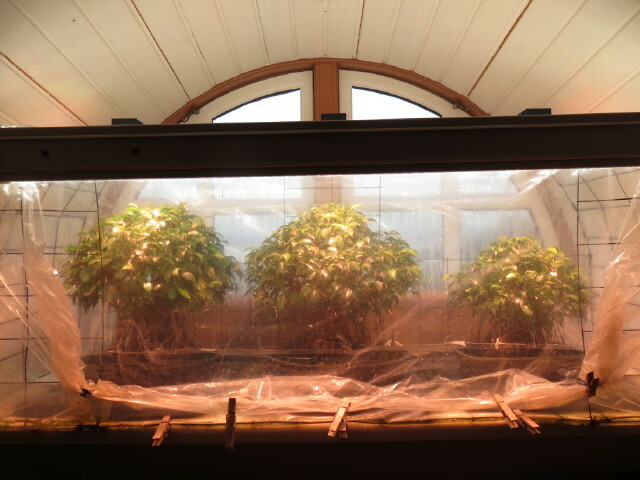 In the winter I used a grow lamp in the daytime, and I will continue with this. The heater in the room, makes sure the temperature does not drop below 18 degrees, and when the sun shines, is it nice and hot. I don’t have a picture of the other tree as I was working on it, reducing the height, and it will take a couple of years, before it is worth looking at. The tree on the right was shooting a lot from the underside of the lowest branches now. I decided to let them grow very strong, and keep the top small. The tree on the left was also shooting from the inner part of the lowest branches ( not the trunk), and that was good. When I took the picture, this small kifu had just been accepted for the EBA in Ratingen. 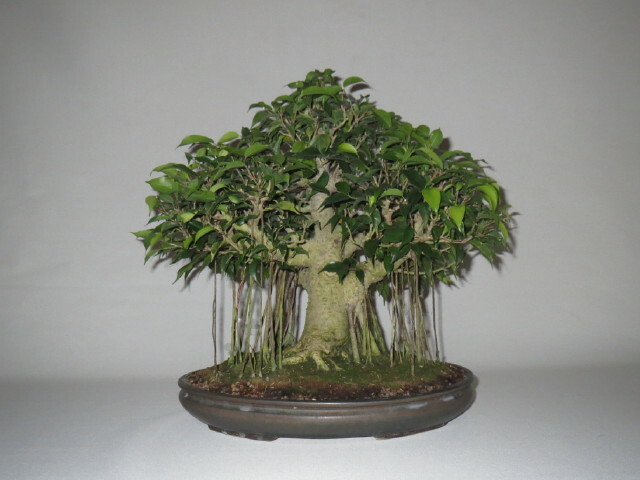 This was the first time this tree was ready for exhibition so I felt rewarded for my work. 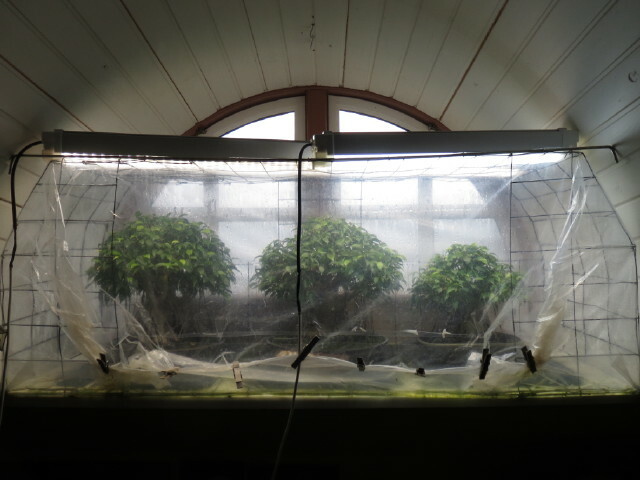 The trees were put back in the indoor humid hothouse over the winter of 2011 and in May 2012 I decided it was time to take the trees to the outdoor humid hothouse. I think they looked very healthy and what surprised me was that over the winter they had not had any airflow in their hothouse. I soon found out it is not a matter of airflow, but of temperature – 21 degrees will make sure mould don’t grow. My experience at EBA/ESA in Germany however had not been so good as I had hoped because the show organisers had changed my information about the origin from “seedling” to “import”. I cannot describe how this felt as I had worked on this tree for many years, just to read this, too late to do anything about it. I will make sure in future that the correct origin is on the card. The trees went back in the indoor humid hothouse over the winter of 2012. 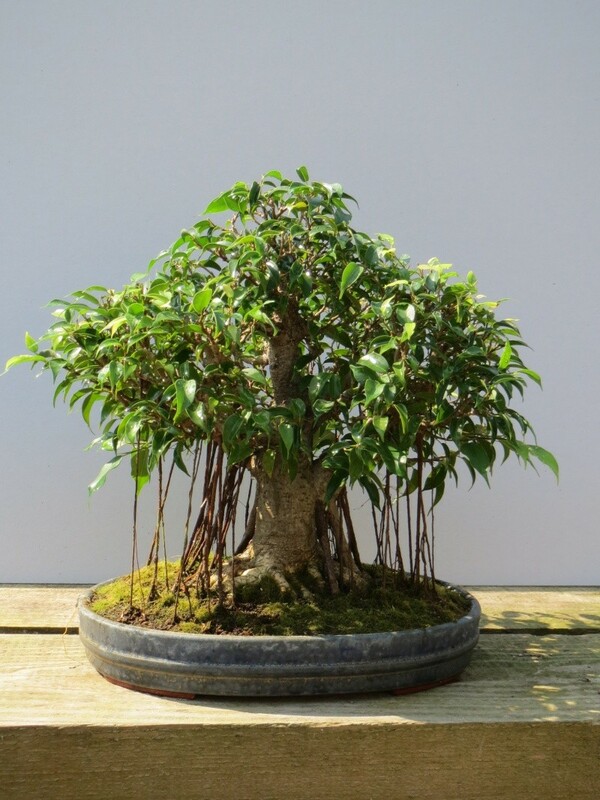 In March 2013 I decided to repot one of the ficus into a new pot by Walsall Ceramics. All three trees have been fed with 2 2 2 fertilizer all winter and this worked very well. With all three trees I was doing what I can to avoid crossed branches as the crown developed. The top on one had become weak, as all the aerial roots from the lover branches had grown too strong. 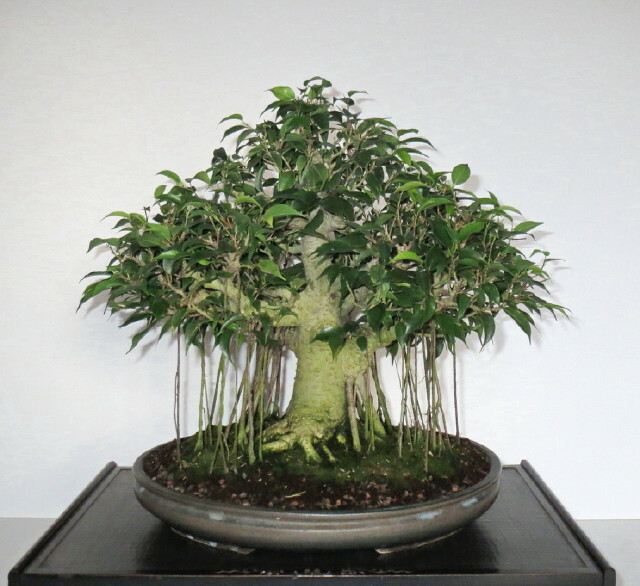 I had to cut it hard back on the lower branches, and thinned a little out in aerial roots. I worked on renewing the top, and the other branches from inside the tree over the summer. It worked, but it took a while. It is not easy with ficus in Denmark…This winter I realized a winter with a lot of low sun coming through the south window, is more important than an average summer. Winter in 2011 was terrible, cloudy weather all the time during the winter, it did not add to really hot weather inside the humid tent, and the trees was a bit on their heels, as the summer arrived. And then the summer was cold and cloudy..terrible. The winter of 2012 was very sunny, and the trees did very well. It was 35–40C and humid in the tent, almost day after day> It was like I was in the tropics every day when I was checking on the trees. The summer of 2013 was good however and the trees had a good summer in the garden humid house, but in the end it became a little cold. This gave a green mould to the trunk and I needed to wash them. Again it shows temperatures are essential for the wellbeing of Ficus in a humid house, as it stopped as soon as they went indoors to the controlled warmth. And now, here at the end of the summer of 2014, this is how the trees look. I am very happy with them as they responded very well considering the country. 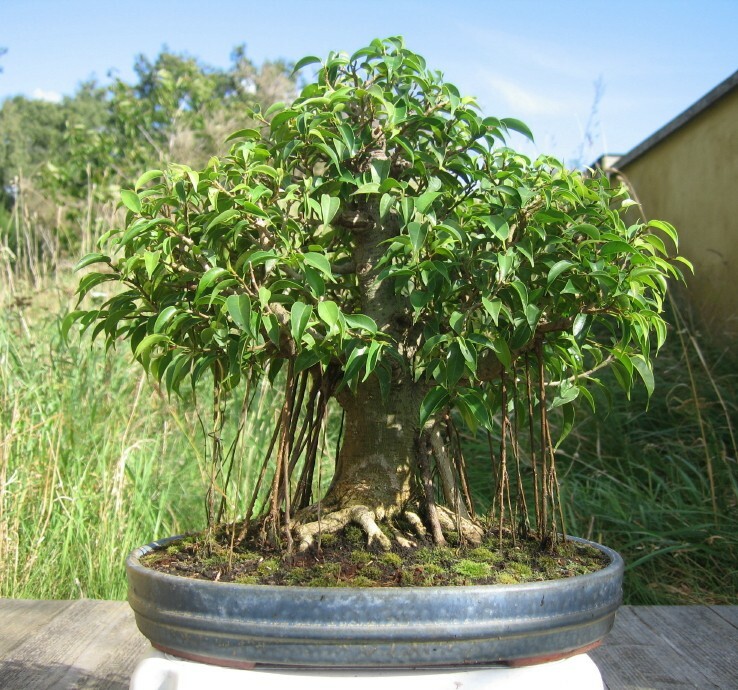 One tree was awarded best bonsai in Denmark in September – my first kifu bonsai to win as I normally only win with shohin. 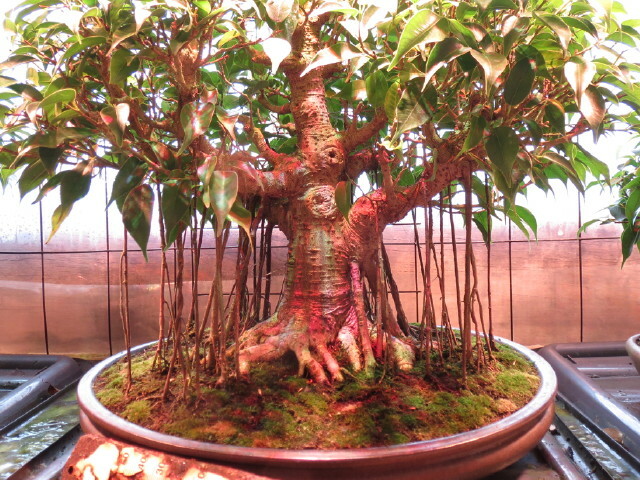 Many people in the northern countries hate ficus because they say they are hard to grow, and don’t belong here. Had I known and given this a thought back then and now in particular, I would never have started them up, as “they” say it cannot be done. But when all is said and done, I DID have progress with the trees every year, as the photos show. Remember, the humidity tent was something new I have added only in the last handful of years – they have been 20 year in the window on their own before that. As the trees become better and better and show their age, I want to give them everything they need for even more progress. The newest LEDs are an experiment for me, and I hope they work. As we speak I have been promised special LEDs of my liking to try out. There will be updates. – hopefully of the happy kind. In their summer camp this year. During daytime the door is open, and it is closed in the evening. The wall behind the greenhouse faces north, and heats up during daytime, and this helps keep the trees warm during the night. As I don’t want/need more aerial roots to develop, and the aerial roots that are already there don’t need extra humid protection, as they are strong and fat enough now, I do think it is safe to let the trees enjoy the fresh air during daytime now and in the future… still they are kept out of direct sun. For my indoor set-up, I take the tent inside and use lights. In periods with low light (no sun) during winter, I was not pleased with the fairly weak LED lamp I had previously invested in, and I needed something better for my trees, as I could see the internodes were a bit longer now than when I used a T5 lamp. I bought 3 M30 units, one for each tree and I look a lot forward to see, how it will work for my trees. The look on how the trees were in the new light scared me. Can this be healthy? Pretty is it not; it looks spray painted. Quickly I found out that adding the old lamp in the front removed the painted colours and made the trees look normal again in the shaded areas. Maybe in the future, if I see this set up works, I will invest in a couple of more lamps. I once tried to force roots to appear where I wanted them, and it never worked – it only left small unwanted scars. I wait and see what the tree will bring, and take only out, the unwanted roots, the rest is being kept. When a root is ca. 4 cm. long and still white, is it possible to put a finger to the place where it comes out of the trunk, and carefully break the root down in a position growing downwards. 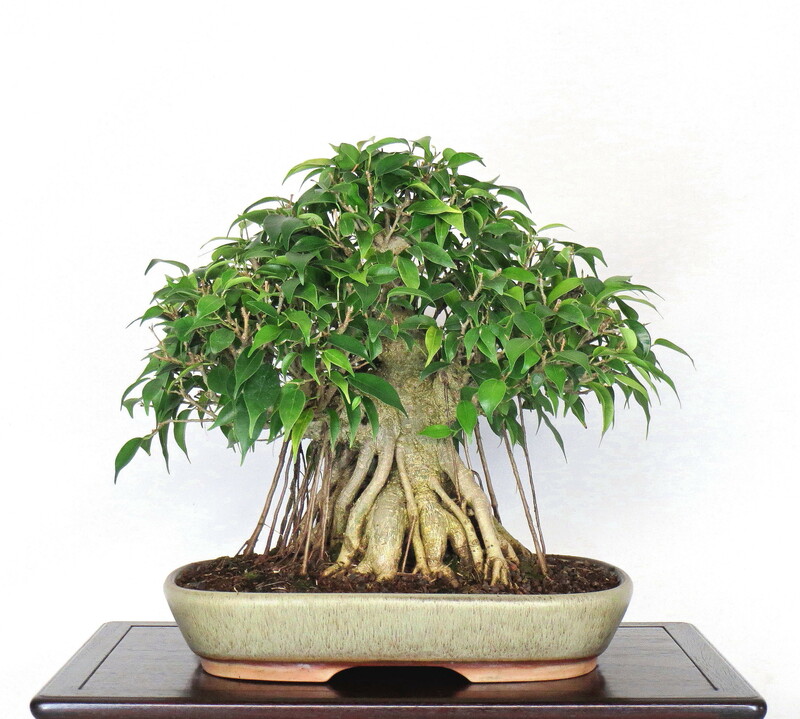 The root is actually half broken, but will, if it is humid, still grow without problems. Later when the root is longer, I take a small piece of wire, in the right length, and place it in the soil where I want the root to go in. The top of the wire leans towards the root. Thereafter I will take small pieces of tape, and glue the root and wire together. When the root is close to hit the soil, I dig a tiny hole for the root to grow in to. Much later when the root is strong, I remove the wire. A root that is being moved around and bend will very often die back, but can sometimes shoot again. A root glued to a wire as it grows, can take the shape you bend the wire. 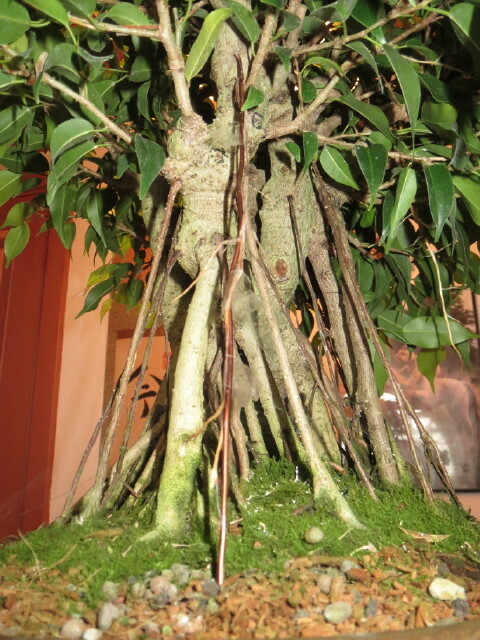 As you can see the soil is kept fairly dry, it is the humid air that does the trick for Ficus as they don’t like wet feet; humid air is better.